Of the 850 children and students who are currently living and being educated at the Father Ray Foundation, only a small minority ever met Father Ray Brennan. Alms for the Buddhist monks. A few of the long term residents at the Children’s Home remember him, several staff members at the vocational school have fond memories and a handful of blind students have a vague recollection of Father Ray. But while most have no recollection at all of him, they all know who he is and what he did for them. 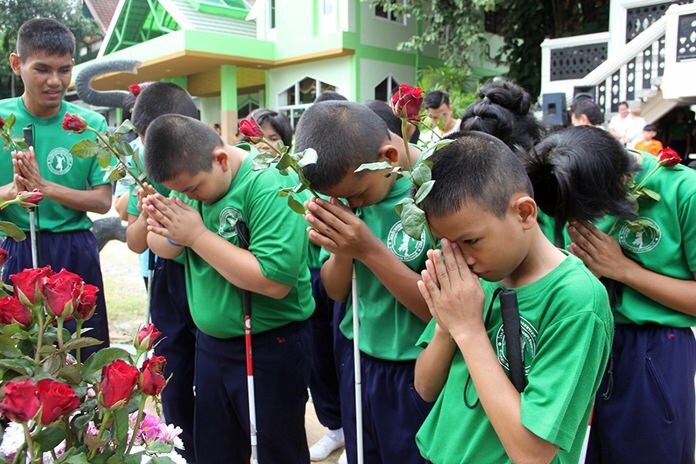 The blind students attended the opening ceremony. Each morning the toddlers at the Day Care Center thank Father Ray in their pre-lunch prayers. 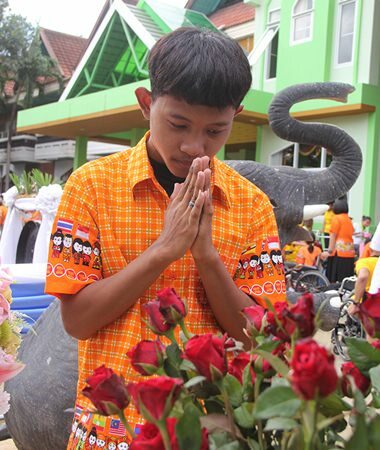 The youngsters at the Children’s Village and Children’s Home wai to his statue on the way to school each morning and the blind and disabled students regularly pay their respect to the founder of their schools. Father Ray died thirteen years ago, in August 2003, and each year August has become known as Father Ray Month, which sees the children and students from all projects come together to remember and celebrate the life of the man whose dedication to the needy in Pattaya changed the lives of thousands. 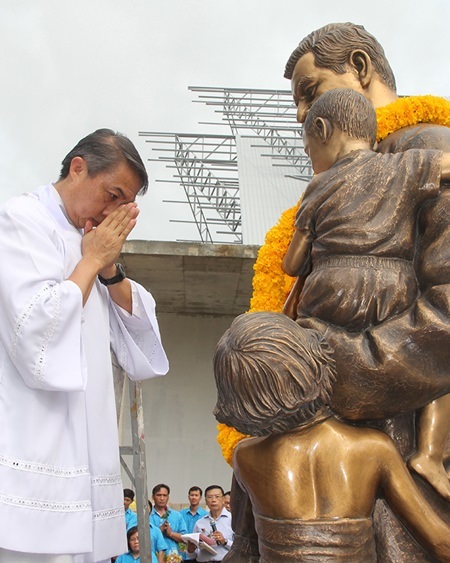 This year it all started with the opening ceremony, which saw a large crowd gather to watch as Father Peter, current president of the Foundation, clean and decorate the statue of Father Ray. 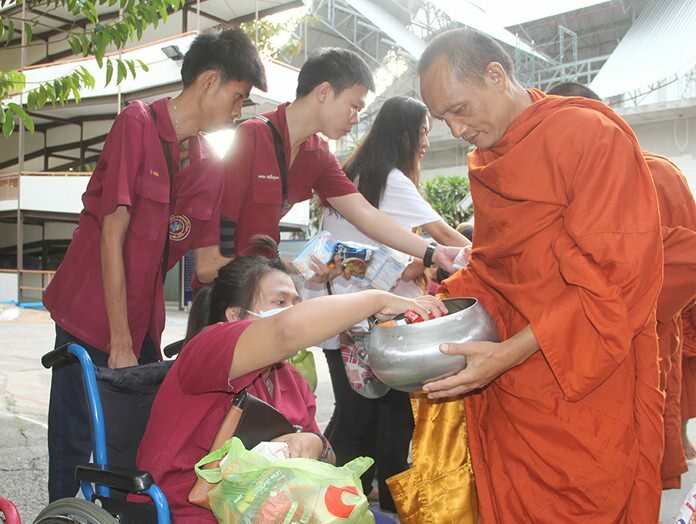 Early one morning nine monks arrived from a local Buddhist temple to receive alms from the students with disabilities in the hope of making merit for Father Ray. 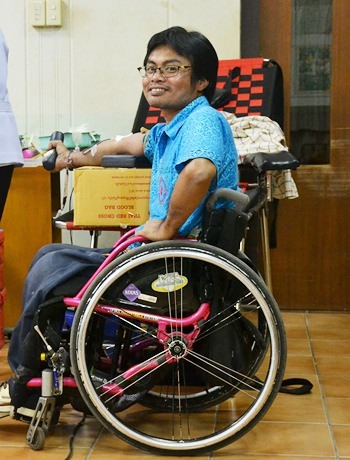 The Thai Red Cross arrived to collect blood, all in the name of Father Ray, and more than thirty five liters of the red stuff was collected. 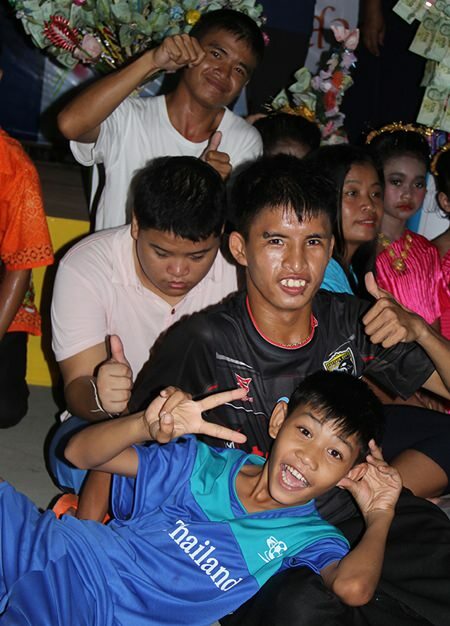 The closing ceremony of Father Ray Month saw a party atmosphere where the children of all ages and the students with different disabilities all sang and danced together along to songs. 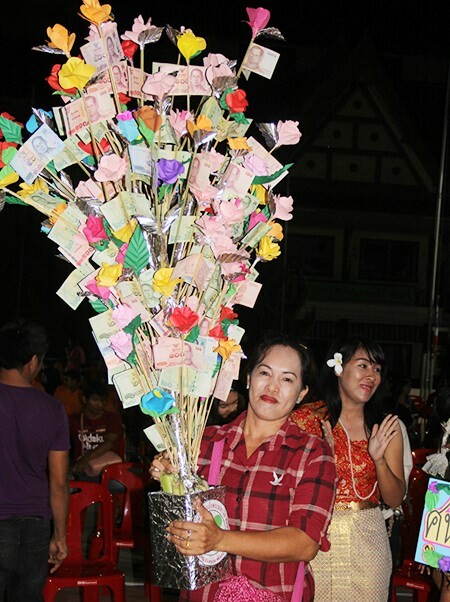 They watched several dance performances, traditional and modern, two blind youngsters got the crowd screaming with their rendition of a Thai pop song and there were prizes for the best money trees. 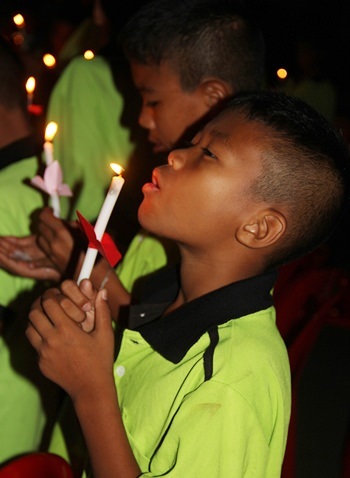 It all came to an end with a candlelight ceremony, which thankfully this year saw not a single child rushed to the clinic to be treated for small burns. As the candles were lit, those gathered said a prayer of thanks to Father Ray, even though most never got to meet the man. A memorial mass at St. Nikolaus Catholic Church saw many listening to the service outside as there was no more room inside the church. But once the service was over the gathered crowd made their way to the cemetery where they paraded past Father Ray’s final resting place. 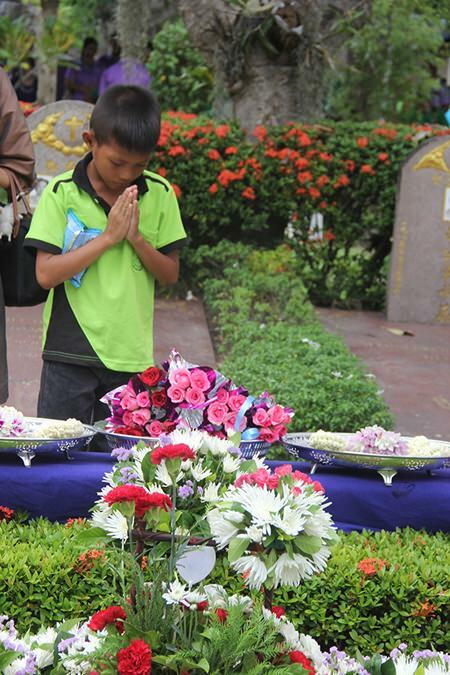 It was here that one little boy, nine years of age and a new resident at the Children’s Home, made his way to the front of the crowd, and standing in front of the grave, with a bag of noodles tucked under his arm, he waied, bowed his head and laid down a single red rose. Thank you Father Ray. Father Peter cleaned and decorated the statue of Father Ray. A brave teacher gives blood. A very heavy money tree. Candles and prayers of thanks. 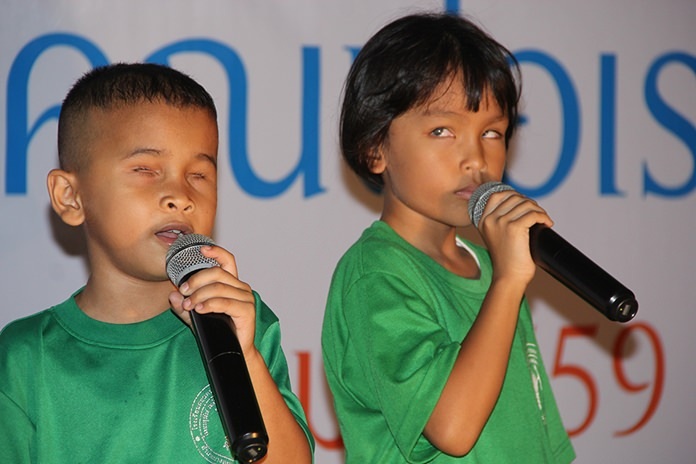 Future superstars from the School for the Blind. 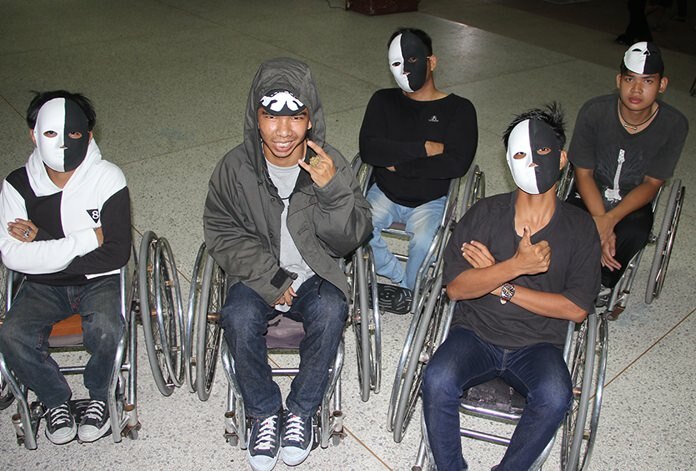 The boys with special needs also attended. This young man was a small boy when Father Ray died. Now he is a student. Two dancers, one teacher and an accountant, were magnificent.